Melissa Kenny: Eddie’s in there?! 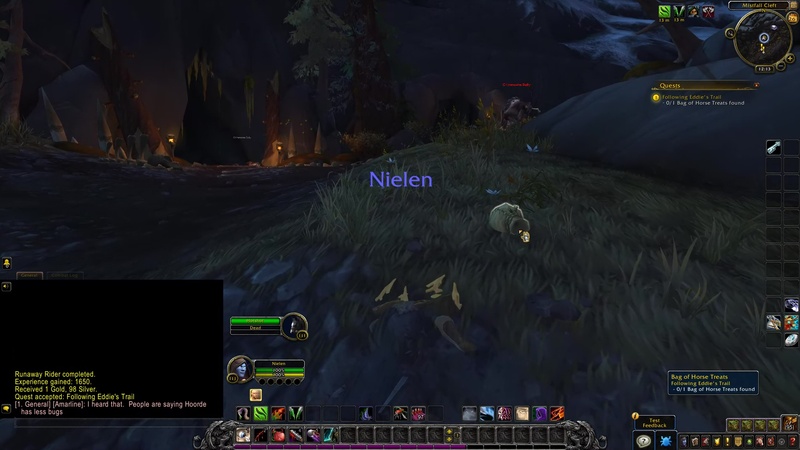 That place is full of troggs! Melissa Kenny: My life is equestrian. I’m not a fighter. I could maybe take a trogg or two, but not a whole tribe. Please, go into Mistfall Cleft and see if you can find Eddie. Lord Norwington would be furious if something happened to him, and nobody wants to bear witness to that! Follow the trail of Eddie Norwington. TIP: The corpse of Hotshot (horse) is a few yards to the east. The Bag of Horse Treats is on the ground, up the hill to the north from Hotshot. 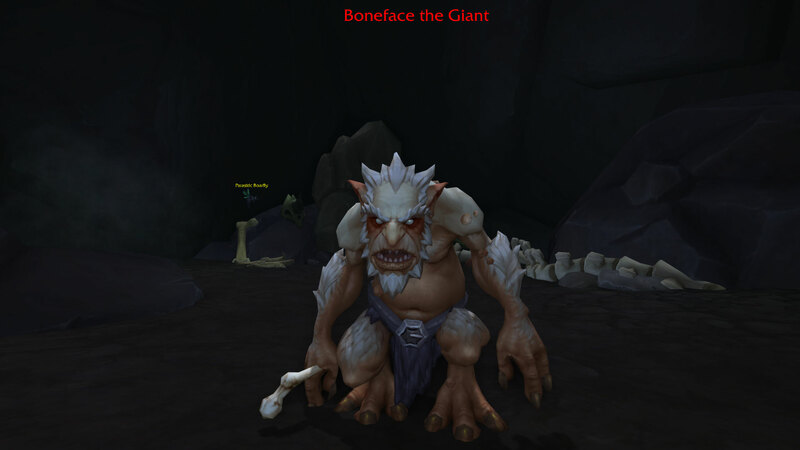 North of the Bag of Horse Treats is Boneface the Giant (trogg) inside a cave. Loot the Boneface’s Key from him. Eddie Norwington: I’m over here! He has the key! Please, help me! 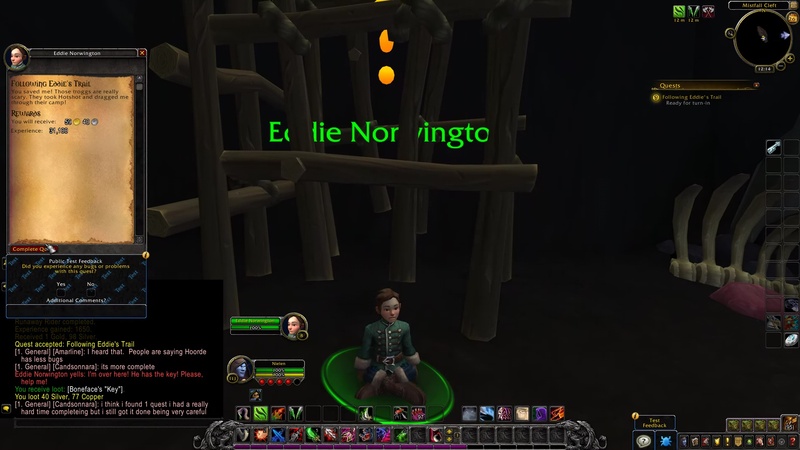 TIP: Click the cage, then talk to Eddie Norwington to turn in the quest. Eddie Norwington: Are… are you here to save me? Eddie Norwington: You saved me! Those troggs are really scary. They took Hotshot and dragged me through their camp! Eddie Norwington: Is… Is it safe to get out? 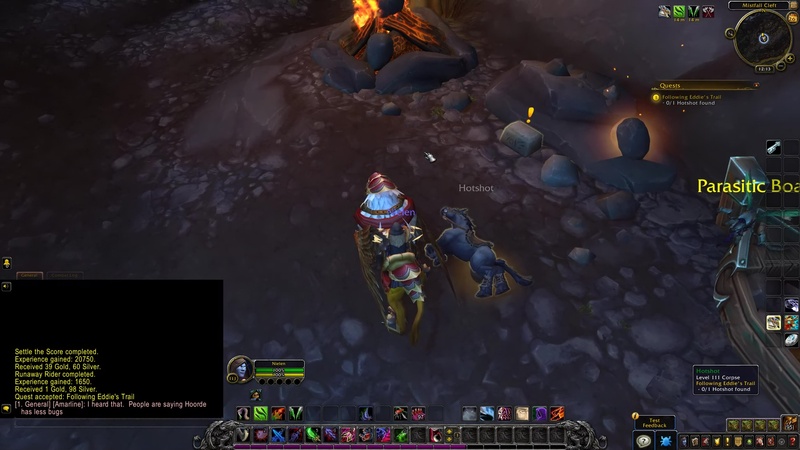 Troggs are really scary! I think I can make it to Melissa if you cleared me a path. Thank you so much for saving me! 6. Deeper into the Woods 12. Stick It To 'Em! 12. Freehold 19. Raise a Glass! 25. Aged to Perfection 29. Missing Treasure! 27. Carentan's Payment 31. Swab This! 35. Air Raid* 38. Cease Fire! • Burn Notice (Alpha) 39. For Kul Tiras! The following quests are not part of "A Sound Plan" achievement. The War Campaign takes you to set a foothold on the Horde land of Zandalar. At the beginning, you can choose one of three foothold destinations: Zuldazar, Nazmir, or Vol'dun. At Honored, Revered, and Exalted with the 7th Legion, you can buy Mission Table reports from the 7th Legion Quartermaster. These unlock new flightpaths in Zandalar.